Is your fridge empty? If so, get hold of a BMW or MINI from DriveNow, set off to your local REWE and fill the car up to the brim. And besides being extremely convenient, it's also really cheap! How do you use the REWE Package? When you park your car within 150 metres of a participating REWE store, your screen will display all the details about the REWE Package. Enter the parking mode using the "Take a break" feature, remove the discount card from the central armrest and hand it in to be scanned at the till. You'll find a code on your receipt, which you'll need to enter into the screen in the car. Depending on how long you've been parked, you'll receive a credit of up to 30 minutes. Did you know? All participating REWE stores can be found in the navigation system under "Special points of interest". "You will receive a 5% discount at REWE grocery stores. Enter the code on the receipt in the car to redeem up to 30 minutes of free parking. 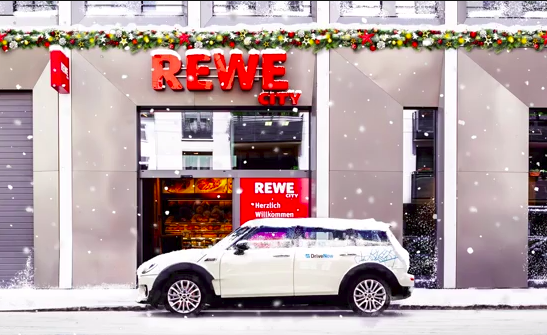 Once selecting the REWE package you agree that DriveNow can access you personal shopping data related to REWE at the time of purchase, and that your status as a Drivenow customer at REWE can be used anonymously for market research purposes. In order not to be part of the statistical evaluations, do not use the discount card. The discount is only valid in participating locations, the REWE discount is not valid for these items: books, newspapers, magazines, tobacco products, deposits (on bottles and cans) , Tchibo items, iTunes, telephone and gift cards."